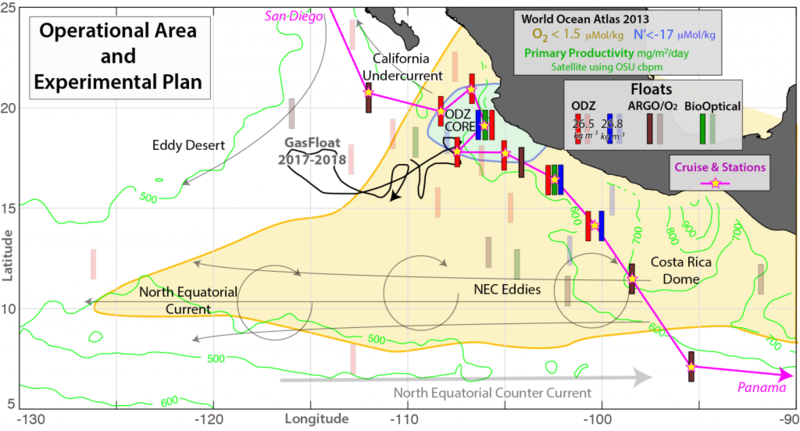 Oxygen deficient zones (ODZs) constitute a small fraction of total oceanic volume yet play an important role in regulating global ocean carbon and nitrogen cycles. They are critical for regulating the ocean’s nitrogen budget, as loss of biologically available nitrogen to N2 gas (N-loss) within ODZs is estimated to be 30 to 50% of the global total. However, temporal and spatial variability in N-loss rates have been undersampled by ship-based process studies leaving substantial uncertainty in overall rates. While local and short-term regulation of N-loss by O2 and organic matter availability is well documented, little is known about the larger scale temporal/spatial variability in N-loss that may result from physical forcings such as remote ventilation, seasonal variability in vertical exchange with the near-surface layer, and mesoscale eddies. Understanding the impact of larger scale physical forcings on N-loss as mediated through O2 and organic flux is needed to fully understand the causes and consequences of any future ODZ expansion. To achieve this, we need sustained observations by a distributed array capable of detecting synoptic variability. How does biogenic N2 production in ODZs vary over weekly to annual time scales and space scales of 10s to 1000s km? What are the major scales of variability and their associated oceanographic phenomena and how do they relate to control by organic matter flux and O2 concentration? How does this variability influence regionally integrated N-loss? Figure 1. The ETNP ODZ roughly defined by O2 <1.5 μmol/kg (orange, World Ocean Atlas 2013). Our new NSF-funded project will sample across these patterns of spatial and temporal variability for 2 years with 10 subsurface ODZ floats (red/blue) each measuring profiles of T, S, O2 (50 nmol/kg LOD) and N2 (0.1 μmol/kg precision), and the in situ rate of N2 change. Four Argo floats with O2 sensors and BioOptical floats provided by collaborators will supplement this array. Bright bar symbols are the planned deployment positions; dimmed bar symbols suggest possible displacements after 2 years. 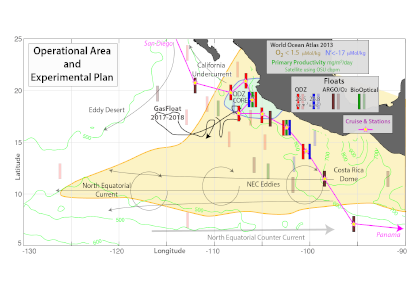 Ship-based measurements (yellow stars) along the deployment cruise track (magenta) will be used for float sensor calibration and identification of ETNP source water properties. The 2-year track of our prototype GasFloat is also shown (black line). 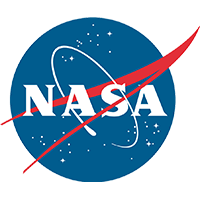 This project will exploit our ability to make in situ, ultra-high precision measurement of N2 concentration (~0.1 umol/kg) and use commercially available O2 sensors to measure O2 in the 10s of nM range. Our study area is the Eastern Tropical North Pacific (ETNP), the largest ODZ and the region of our successful pilot deployments (Figure 1). Over a multi-year period, our study will determine in situ nM-level O2 and biogenic N2 on float profiles distributed throughout the ETNP and encompassing geographic gradients in O2 and surface productivity. For the first time, our study will also determine in situ N-loss rates from changes in N2 concentration during one- to two-week Lagrangian float deployments drifting along a constant density surface (Figure 2). A pilot two-year float (‘GasFloat, Figure 1) deployment in the ETNP has documented our ability to do so. Critically, our float-based approach more closely matches the frequency and distribution of observations to the expected variability in biogenic N2 production, as compared to prior work. This study will also dramatically increase the data density in this region by acquiring >500 profiles/drifts for N2 and >1000 profiles for nM O2. Figure 2. 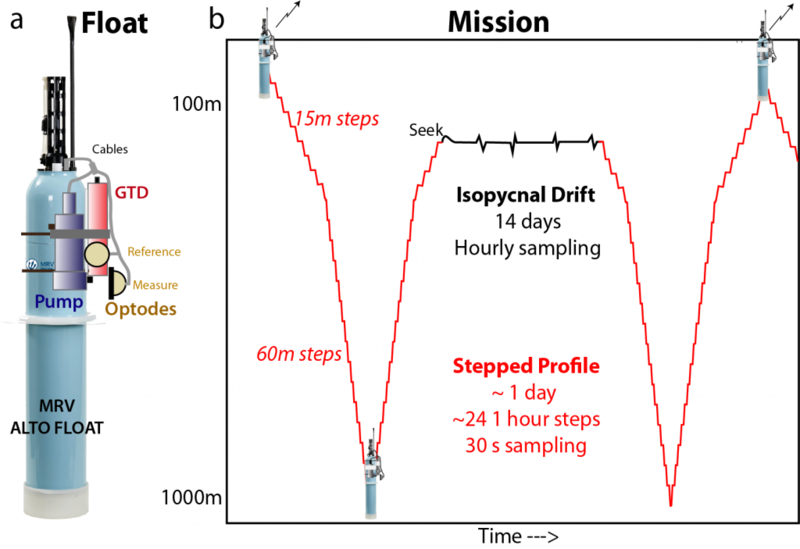 (a) Schematic of float system to be deployed (b) Example of float mission including 2-week isopycnal drift. We anticipate float deployment in summer 2020 via a UNOLS vessel. 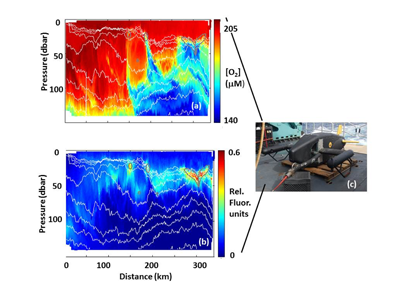 Investigators interested in collaborative participation through contribution of autonomous instrumentation and/or making shipboard measurements are encouraged to contact the lead PI Mark Altabet at maltabet@umassd.edu. Similarly, students interested in graduate research opportunities through this project should contact the lead PI. Coastal habitats are critically important to humans, but without consistent and reliable observations we cannot understand the direction and magnitude of unfolding changes in these habitats. 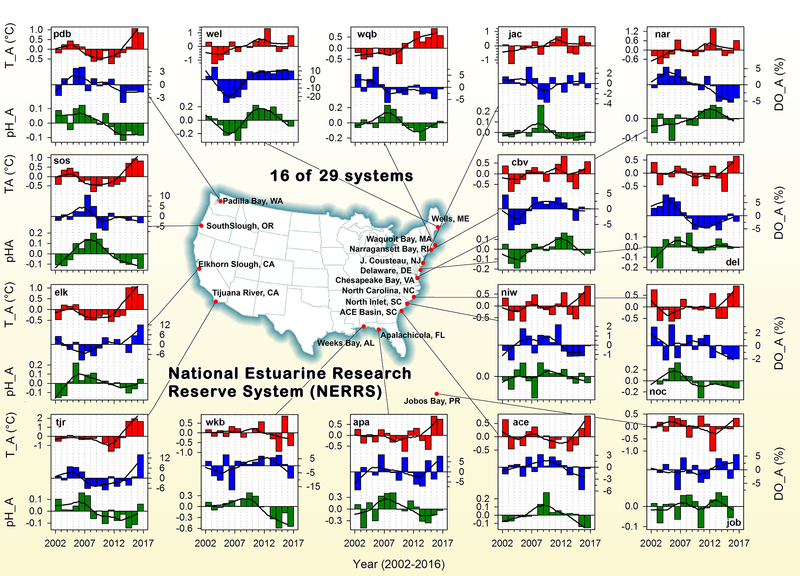 Environmental monitoring is therefore a prescient—yet still undervalued—societal service, and no effort better exemplifies this than the work conducted within the National Estuarine Research Reserve System (NERRS). NERRS is a network of 29 U.S. estuarine sites operated as a partnership between NOAA and the coastal states. 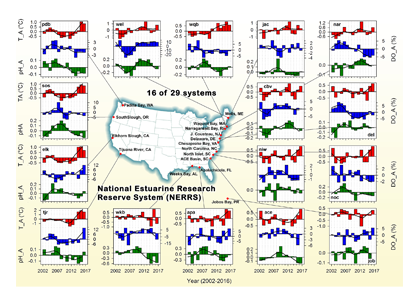 NERRS has established a system-wide monitoring program with standardized instrumentation, protocols, and data reporting to guide consistent and comparable data collection across all NERRS sites. This has resulted in high-quality, comparable data on short- to long-term changes in water quality and biological systems to inform effective coastal zone management. Figure 1: Using dissolved oxygen and salinity, monthly mean pH can be predicted within and across coastal systems due to the unifying metabolic coupling of oxygen and pH. In a recent study published in Estuaries and Coasts, Baumann and Smith (2017) used a subset of this unique data set to analyze short- and long-term variability in pH and dissolved oxygen (DO) at 16 NERRS sites across the U.S. Atlantic, Caribbean, Gulf of Mexico, and Pacific coasts (> 5 million data points). They observed that large, metabolically driven fluctuations of pH and DO are indeed a unifying feature of nearshore habitats. Furthermore, mean pH or mean diel pH fluctuations can be predicted across habitats simply from salinity and oxygen levels/fluctuations (Fig.1). 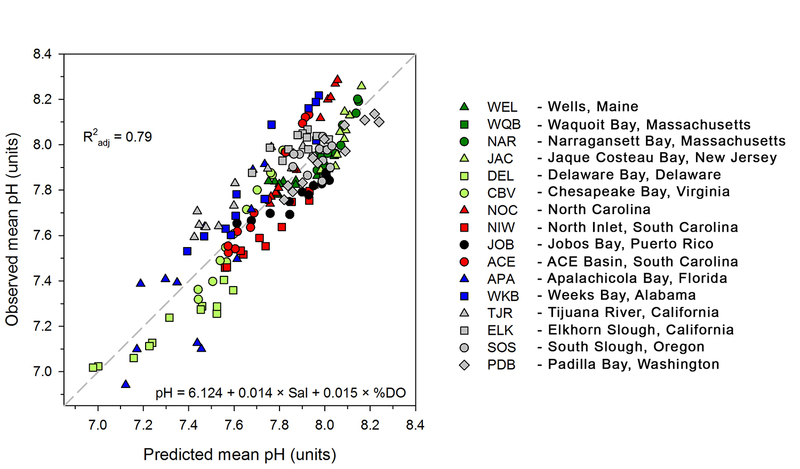 These results provide strong empirical evidence that common metabolic principles drive diel to seasonal pH and DO variations within and across a diversity of estuarine environments. As expected, the study did not yield interannual, monotonic trends in nearshore pH conditions; rather, interannual fluctuations were of similar magnitude to the pH decrease predicted for the average surface ocean over the next three centuries (Fig.2). Correlations of weekly anomalies of pH, oxygen, and temperature yielded strong empirical support for the hypothesis that coastal acidification—in addition to being driven by eutrophication and atmospheric CO2 increases—is exacerbated by warming, likely via increased community respiration. Figure 2: Interannual variations in temperature, pH, and dissolved oxygen (DO) anomalies in 16 NERRS sites across the US Atlantic, Gulf of Mexico, Caribbean, and Pacific coasts. Analyses of these long-term data sets have provided important insights on biogeochemical variability and underlying drivers in nearshore environments, highlighting the value and utility of long-term monitoring efforts like NERRS. 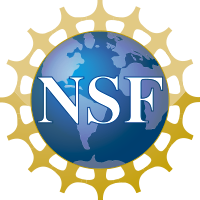 Sustained, high-quality data sets in these nearshore environments are essential for the study of environmental change and should be prioritized by funding agencies. The observed metabolically driven pH and DO fluctuations suggest that local measures to reduce nutrient pollution can be an effective management tool in support of healthy coastal environments, a boon for both the habitats and humans. The biological pump is complex and variable. To better understand it, scientists have often focused on variations in biological parameters such as fluorescence and community structure, and have less often observed variations in rates of production. Production rates can be estimated using oxygen as a tracer, since photosynthesis produces oxygen and respiration consumes it. In a recent article in Deep Sea Research Part I, the authors presented high-resolution maps of oxygen in the upper 140 m of the ocean in the subtropical and tropical Atlantic, produced from a towed undulating instrument. This provides a synoptic, high-resolution view of oxygen anomalies in the surface ocean. These data reveal remarkable hotspots of biological production and respiration co-located with areas of elevated fluorescence. These hotspots are often several kilometers wide (horizontal) and ~10 m long (vertical). They are preferentially associated with edges of eddies, but not all edges sampled contained hotspots. Although this study captures only two-dimensional glimpses of these hotspots, precluding formal calculations of production rates, likely estimates of source water suggest that many of these hotspots may actually be areas of enhanced respiration rather than enhanced photosynthesis. The paper describes a conceptual model of nutrients, new production, respiration, fluorescence, and oxygen during the formation and decline of these hotspots. These data raise intriguing questions–if the hotspots do indeed have substantially different rates of production and respiration than surrounding waters, then they could lead to significant changes in estimates of production in the upper ocean. Additionally, understanding the mechanisms that produce these hotspots could be critical for predicting the effects of climate change on the magnitude of the biological pump. 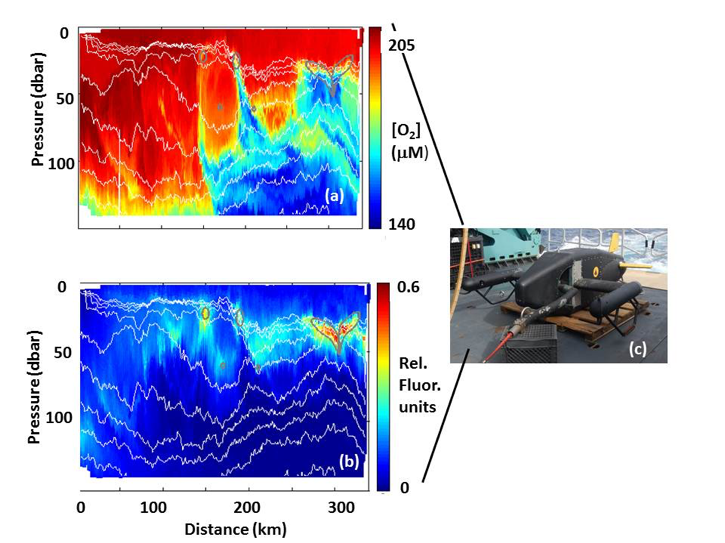 (a) Oxygen concentrations and (b) fluorescence at ~1 km resolution over 300 km from 15.13°N, 57.47°W to 12.30°N, 56.42° W, as measured by sensors attached to the (c) Video Plankton Recorder II. Note that no contouring was used for this plot – every pixel represents an actual data point. Figure modified from Stanley et al., 2017. VPR image photograph by Phil Alatalo.